Destination Wedding: Low season Wedding in Phuket, HOW? Small details make difference. Here at Wedding Boutique Phuket we always pay attention at every single aspect of your Destination Wedding in Thailand, but what makes unique our Tailor-Made Service is the special care we have for the little things. As Destination Wedding Planner, we believes that the most important aspect of your Event is to Wow your Guests during that Day, to create a relaxed atmosphere where everybody can enjoy the moment and be a part of our Couple’s happiness, to leave a Memory of that unique Wedding. How to do that? One of the most important aspects of a Perfect Wedding is to create customized Favors and unique Stationery for every Couple. It’s a lovely way to thank all your Guests and to make your Destination Wedding in Thailand unforgettable. Wedding Boutique Phuket, with on site Graphic Design studio, offers you a very personal and professional assistance for your Wedding Stationery Design. Have a look and see some examples of what we have done so far! (see the full gallery here) For this young Chinese Couple Ilaire, your Destination Wedding Planner in Thailand, has created customized Wedding Program Fans with special thanks by the Couple. Pretty and helpful during the Ceremony under the sunshine. “It’s very important to coordinate every little aspect of the Wedding Design, match every little detail” she says. As you might notice from the Wedding Favors labels and packaging with the Couple Logo designed by Wedding Boutique Phuket. A unique graphic for the most tropical Wedding Invitation in green and yellow theme colors, as Lilia & Arseny from Singapore wished to have for their very special Day in Phuket. The perfect Invitation Card if you chose a Destination Wedding in Thailand! Sweet Treats are the last trend right now, together with the “Travel themed” ideas, very popular for your Destination Weddings! Wedding Boutique Phuket takes care of you and your Guest from the beginning of the Wedding Planning till the end of the Wedding Day. “The first important step is to create the Wedding Inspiration Theme, following the Couple’s Dream outline, their favorite colors, their mood” – explains Ilaire –“then we will design the coordinated stationery for the full Event”. Honey Jars are always welcome, sweets small favors personalized with adorable ‘Meant to Bee’ or ‘Love is Sweet’ labels and tags. Another unique touch we are able to give to your Wedding in Phuket are the Handwriting items. Signs, props, place cards… when something is handmade is always much appreciated! Jasmine, our Bride from Hong Kong, applied to a Handwriting course to be able to write her Guests name cards by herself, we loved her creative attitude toward her Wedding! “Black is the new Black” this is the 2016/17 Wedding Trend. Your Destination Wedding Planner in Phuket choose this ‘Chalk Style’ for an elegant and sophisticated Save the Date card. We definitely love to add classy European details for your Wedding in Thailand! Would you be my…? Can’t say no with these unique personalized Bridesmaid and Groomsman gift cards. It’s a great honor to be part of the Ceremony and with these Invitations even more! Telia & Greg’s Wedding, has definitely been so unique because of the very strict cooperation between our Destination Wedding Planner in Phuket, and the Bride from Australia. Telia is actually a Graphic Designer herself, so was love at first sight with Ilaire since the beginning, when she was looking for the right Wedding Planner in Phuket to design the Event of her dreams. After this successful cooperation together Ilaire & Telia are now willing to work together again to assist many other Brides for their stationery design! Wooden Rings Box & engraved Wooden stationery for the Rustic Chic Theme chosen by a beautiful couple from New Zealand: Jen & Gavin. 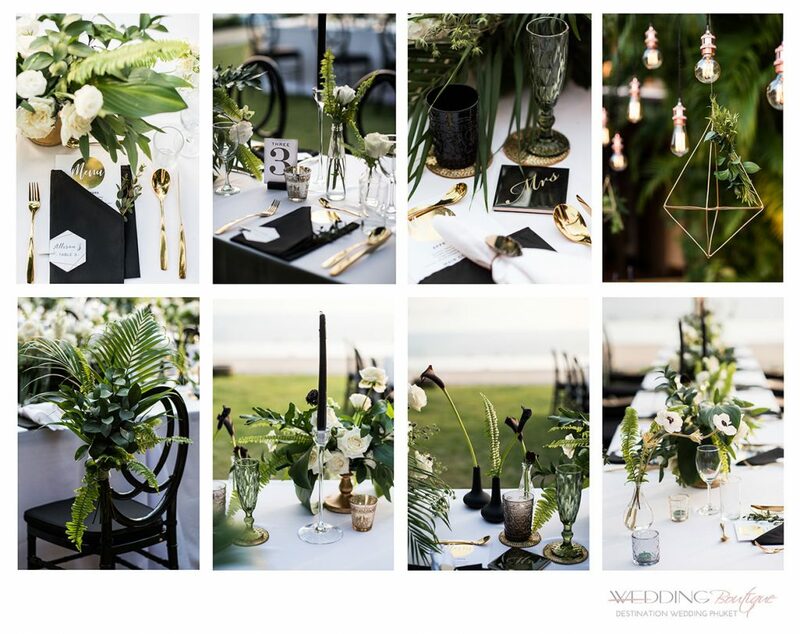 Natural elements that perfectly match together, for a simple and elegant Wedding on the beach in Phuket. Cool down the dinner time with a personalized hand welcome fan with Thanks & Menu print! The graphic designed by Wedding Boutique Phuket suits perfectly with the Purple Fairy Tale Theme chosen by the Couple for their Destination Wedding in Thailand. Butterflies everywhere for Claire & Brock from Australia! Wedding Boutique Phuket, Where love comes true. I am interested in your wedding stationary and wedding favors. Do you have a list of different styles and costs? Our wedding is on the 1st of July. Many thanks.